Next in our series of interesting applications for an in-chamber vacuum sealer is curing. Typically this technique involves applying some combination of salt, sugar or spices to a protein -- such as fish or pork -- and letting those spices draw out moisture and change the texture and flavor. With a vacuum sealer, the flavor profile that used to take one to three weeks to develop can be recreated in as little as two days. For example, for gravlax, simply follow the familiar steps of the curing process: add your spice mixture to your salmon; seal it in a vacuum sealer bag; and take the fish out of the bag and repeat the sealing process every six hours or so. The nature of vacuum sealing means that the cure mix will be pushed into the salmon, shortening the process. 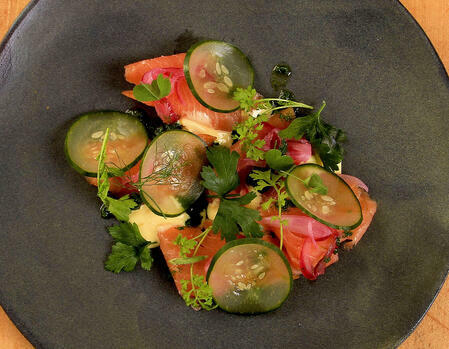 In just two days, your gravlax will be ready to serve. In addition to curing, you'll find out some other creative ways to use this versatile piece of kitchen equipment that you may not have thought of.